Summary: Engagement of firefighters was limited yesterday due to an intermittent failure of the primary radio system. The system was tested extensively and technicians believe that the problem has been identified and solutions are being implemented. Further testing is ongoing and firefighters are expected to re-engage today. The safety of fire personnel and the public is our primary concern and communication is a cornerstone of insuring that safety. Due to the volatility of the fuels and the difficult terrain, a full suppression strategy and indirect tactics has been implemented as the best option for successful containment and control. Strategy and tactics are under constant re-evaluation by fire and land manages to ensure the most effective and efficient actions are taken. At this point, the majority of indirect line has been completed due to the hard work of the firefighters. 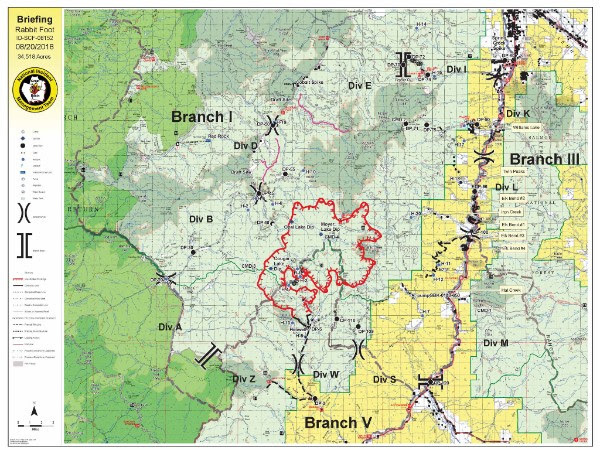 An opportunity in the Van Horn creek area, allowed firefighters to move adjacent to the fireline and establish an anchor point producing a 3% containment of the fires edge. Structure protection has also been a priority with 70 sprinklers kits already deployed. Planned burnout out operations to strengthen containment lines are in place and will occur when weather conditions are favorable. Initial attack resources are identified for rapid deployment should a new start occur in the management area. Helicopters are available for water drop missions, logistical support as well as medical assistance. Weather: A Red Flag Warning has been issued by the National Weather Service for thunderstorms, lightning and strong outflow winds. Storms may bring up to .50 inches of rain on parts of the fire area. Temperatures will be in the mid 60’s to lower 70’s, with humidity 34-44%. Winds will be out of the north 12-18 mph with gusts to 55 mph. or the Salmon-Challis Facebook page (https://www.facebook.com/salmonchallisnf/).